This is the first of three interviews. This is a very intimate image in a sensitive situation, can you please tell us the backstory on this? 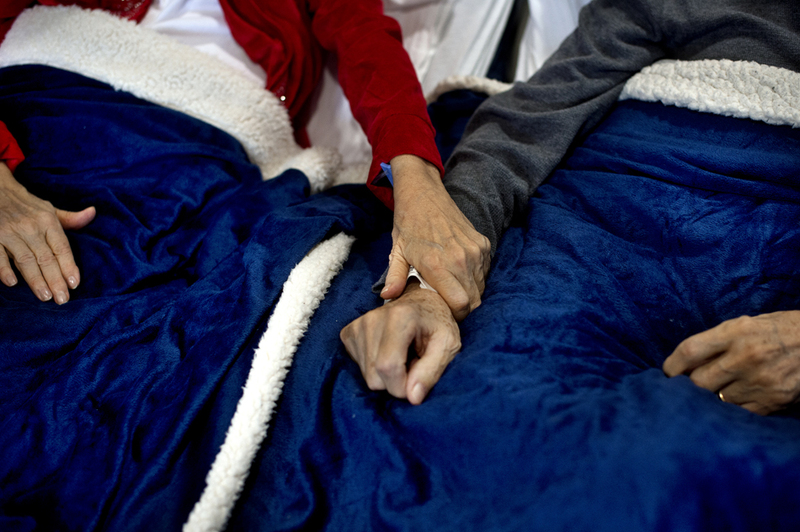 Sure, Joanne and Ronald Johnson ended up in the hospital at the same time, Joanne with a broken hip and Ronald, who had been fighting cancer, was just placed in hospice care. Knowing that Ronald's health was failing, the local hospital staff arranged for the two to be in the same room during their stay. The staff even moved their hospital beds right next to each other. The story was to highlight the Johnsons' strong relationship and how the hospital accommodated them. How did you establish this contact and get into this situation? The Johnsons' daughter, Mary Fuentes, tipped us off. The assignment came in the day that the Johnsons were planning to leave the hospital and staff photographer Neil Blake, who was assignment editing that week, immediately contacted hospital media relations to see if we could get in. The request was okayed and I headed to the hospital. How were you received by those in the room, and how did you move in the space? Once I got to the hospital I was greeted by Mary and her two brothers. 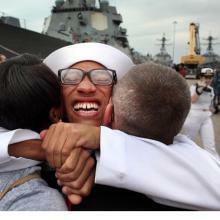 I felt that the family was happy that I was there. It was a tough situation for all of them since Ronald was extremely sick, but they wanted to get the word out about what the hospital had done. I explained what the focus of our story was and all agreed to allow me to shoot images of them in the hospital and then some of them settled in at home. I told the family to ask me to leave at any time if they felt uncomfortable with me there. The room was relatively small and there were family members and hospital staff coming and going. There was a lot of activity as everyone was getting things ready for the Johnsons to leave. Due to the sensitive situation, the amount of activity and the size of the room, I didn't feel comfortable moving around much. I set up against the wall in front of the Johnsons' beds. I wanted to be in a position that I could work from that was not in the way. 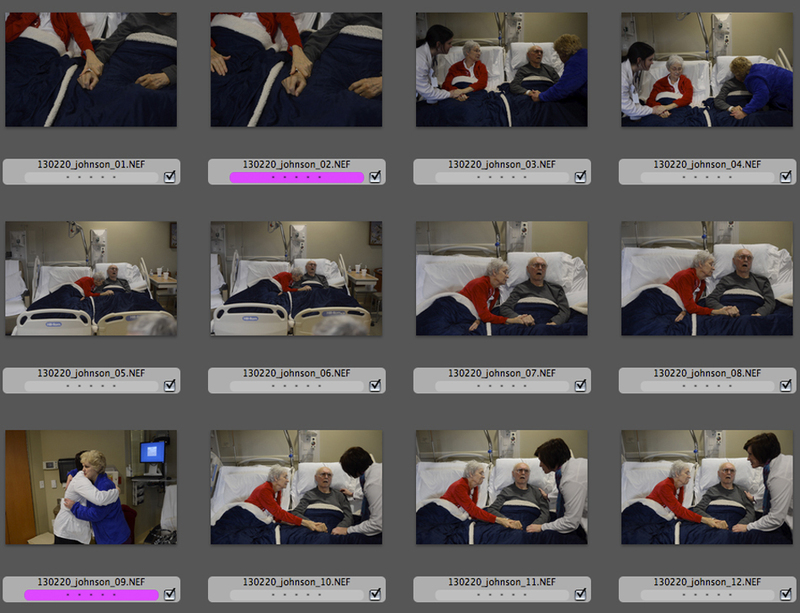 Also, I placed myself in a spot where I thought I could capture images that would show the hospital beds together and that would allow me to photograph the couple's interaction. I'm sure there were other spots that could have worked, but I picked a position and I committed to it. My focus was on Joanne and Ronald, everything else was secondary. This fits into the larger culture at your newspaper, can you speak to how this fits in with not only your approach but the staff's approach? At the Midland Daily News we always try our best to get into situations where we can shoot documentary photos. We rarely shoot portraits, even in situations that are last-minute, like in the case with the Johnsons. We like to give documentary a chance. If you have that chance, an opportunity to get something real, more times than not things are going to work out for the better. Honestly, the assignments that we get here aren't any different than other places I've worked. In my opinion the difference is in the photographer who seizes that opportunity, no matter what the assignment is. I don't like when we say in the industry that a potential assignment sounds "non-visual." I always say that I'll shoot anything. You never know what will happen in a given situation. Everyone I've worked with here, current and past photographers and photo editors, really care about documentary photography. That, and seeing what my co-workers are producing, really pushes me to stay a little longer on shoots, look harder and make images that rise above the obvious. Being a photographer has given me a level of access to the world that I don't think I'd have otherwise. It's given me a more well-rounded perspective of life and a greater understanding of my own accomplishments, failures, relationships and tragedies. That access and perspective is greater than any single lesson that I’ve learned about myself. What I've learned about myself as a staff member is I can make images I’m happy with anywhere, anytime and at any assignment. I don’t blame anyone if I come away with an unsuccessful photograph. It's not the editor's fault. It's not the subject's fault. It's not the assignment's fault. I’m there. I have the camera. I have the ability. I either make a good image or I don't. There are bad days, weeks and months. There's always another day, another assignment and another opportunity. What haven’t I learned about others? People are awesome, crazy, normal, interesting, surprising, different and very similar. Joanne and Ronald were holding hands. Joanne would occasionally reach over to speak to her husband. Also, Mary was thanking nurses and other staff members as they came in and out. Mary and the staff would talk to Joanne and Ronald as well. 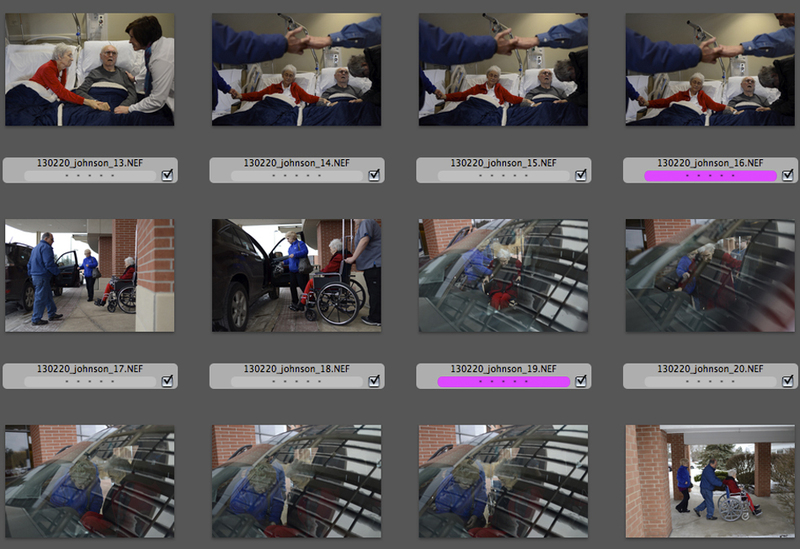 These were all moments I photographed one or two frames at a time. I don't shoot much in general and in this case I shot even less. I always anticipate and guess what will happen next, allowing me to be a half step ahead of developing moments. I also want to talk and interact with people. I'm always trying to balance the two. Once the family had the car ready and the Johnsons were ready to go, the family's pastor, who was there visiting, asked for everyone, including me, to join in a prayer. I asked if I could photograph the prayer instead. No one objected. 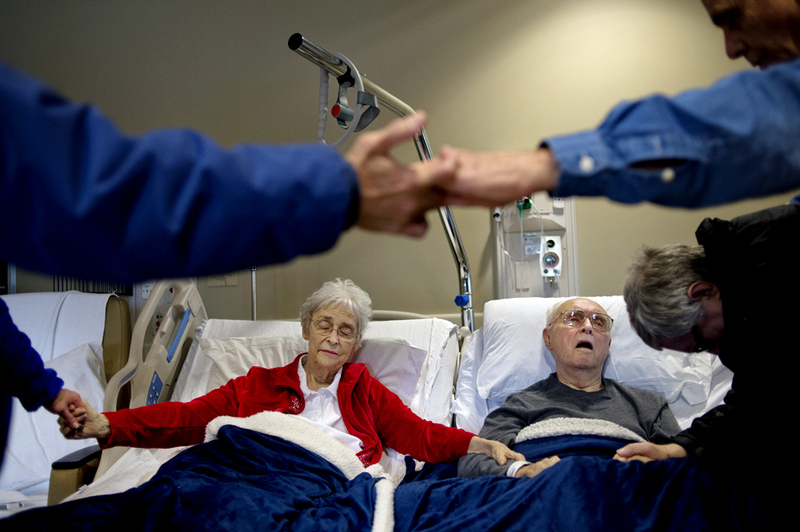 The family gathered around Joanne and Ronald and held hands. From the same spot I'd been in, I crouched down to position Joanne and Ronald below the interlocked hands. From there I shot few frames of the prayer. At the end of the prayer one of the Johnsons' sons became emotional. I walked over and quietly told Mary that I was leaving the room. At that point I felt that I had photographed a pretty powerful scene and it was important to me to give the family their privacy. I followed Joanne out to the car and then I headed to their home. 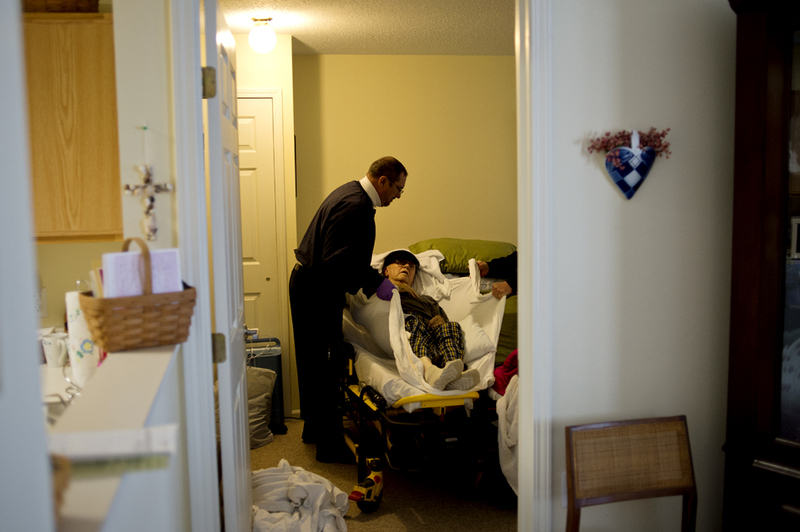 Ronald arrived in an ambulance and medical staff placed him in his bed. I stuck around a little while longer and then gave Mary and the family the option to call me if they wanted me to come back to continue documenting the two. If I was going to continue the story I wanted the whole family to be on board. Ronald ended up dying a few days later and we ran the story with what we had. Put heart into your work. That heart might come to life in the way you work daily assignments, tackle personal projects or develop a way of seeing. Approaching photography with sincere effort and doing work that is personally satisfying will ensure that quality will carry through in your images, into your relationships with subjects and out to the community. 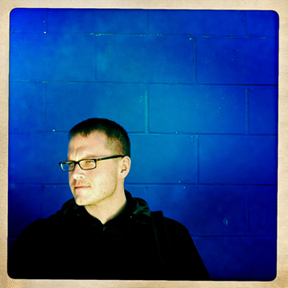 Nick is a staff photographer for the Midland Daily News in Midland, Mich. Prior to Midland, he worked as staff photographer for the Columbia Daily Tribune in Columbia, Mo., and as a photo editor for Evergreen Newspapers in Evergreen, Colo. He loves learning about life from photographing the many people he meets and the various places he visits. Nick's photography and editing work has been recognized by Pictures of the Year International, NPPA's Best of Photojournalism and the Michigan Press Photographers Association, among others. Nick lives in East Lansing, Mich., with his wife, Karen.